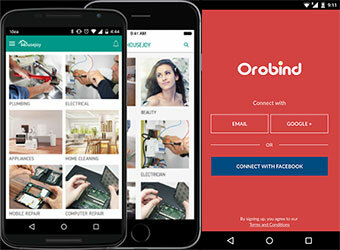 Bangalore-based Sarvaloka Services On Call Pvt Ltd, which operates home services marketplace Housejoy, has acquired at-home personal fitness tech startup Orobind Fitness Technologies Pvt Ltd for an undisclosed amount in an all-stock deal. The deal would give Housejoy a much-needed push to be the largest player in the overall wellness category, claimed the company, declining to divulge the details of the deal. "The acquisition is a part of our strategy to become leaders in this category which has high repeat order rates. We are looking to create a differentiated lifestyle experience for our customers across beauty, fitness and wellness categories," said Saran Chatterjee, CEO at Housejoy. This is company's second acquisition in less than a month. Earlier this month, the Amazon-backed startup had acquired cleaning and laundry startup MyWash Technologies Pvt Ltd. Founded in 2014 by IIT-ians Satya Vyas and Shubhanshu Srivastava, Orobind offers access to fitness experts through the curated marketplace model. The firm is providing fitness services to more than 1000 customers in Bangalore with 135 active personal trainers. The core team of Orobind, including co-founders and senior management, will join Housejoy, the two companies said in a joint statement. Vyas will head the fitness vertical while Srivastava will be chief architect of the technology programme. "It is a proud moment for us to be a part of a larger player like Housejoy and we are looking to further strengthen our wellness category," said Satya Vyas, co-founder, Orobind. Consolidation in the home services space, which has more than 100 home services startups providing an array of services, has been picking up pace this year. This is the third such acquisition in the home services space this year. Just yesterday, on-demand home services platform Zimmber, acquired Gurgaon-based FindYahan India Pvt Ltd.
Last year, Paytm acquired home services provider Near in December. Similarly, Mumbai-based Crenovative Ideas Pvt Ltd, which operates home services startup Taskbob, acquired Zepper Services Pvt Ltd. Gurgaon-based home services startup, UrbanClap is also in the process of acquiring after-sales services platform HandyHome. Housejoy Orobind Fitness Technologies Pvt. Ltd. Sarvaloka Services On Call Pvt. Ltd.